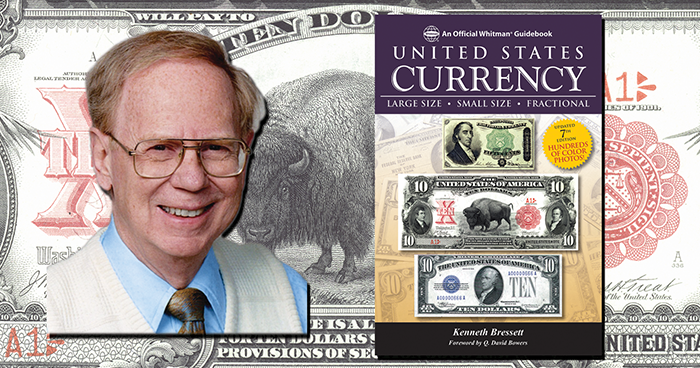 (Atlanta, Georgia)—Whitman Publishing has released the new, seventh edition of the Guide Book of United States Currency, a guide to American paper money by Kenneth Bressett, former president of the American Numismatic Association and longtime senior editor of the Guide Book of United States Coins. The full-color, 352-page softcover book is available online (including at Whitman.com) and from booksellers and hobby retailers nationwide. It retails for $19.95. Bressett covers large-size, small-size, and fractional paper money dating from the 1800s to today. He also explores Treasury notes of the War of 1812; World War II issues; uncut Bureau of Engraving and Printing sheets of currency; and valuable errors such as notes with misprints, folding or cutting mistakes, alignment or ink problems, mismatched numbers, and other anomalies. He discusses how to grade your currency, issues of supply and demand, ways to assemble a specialized collection, proper storage, the dangers of counterfeits, and other hobby topics. The seventh edition has been revised and updated with new pricing and numismatic research. By Kenneth Bressett. Foreword by Q. David Bowers.